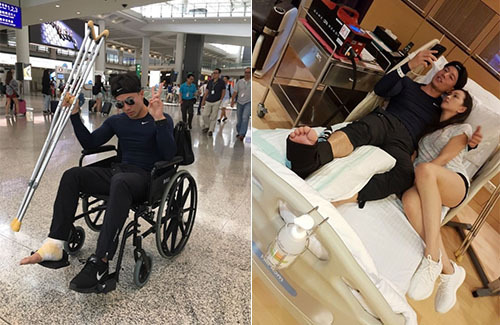 Andy On (安志杰) was rushed back to Hong Kong following a foot injury he sustained after shooting an action scene for his new movie in Ningbo, China. On July 19th, Andy filmed an action scene where he was to abruptly stop after running toward the camera. He ended up slipping, injuring his ankle. He was sent to a hospital in Ningbo that night for a check-up. After realizing that the situation was much worse than it looked, the crew flew Andy back to Hong Kong the following day to receive further treatment. Andy checked in with an orthopedic trauma specialist, who said he tore his Achilles tendon, and recommended him for surgery to stitch the tendon back together.